Includes Six (6) Bottles of New Factory-Sealed Black Toner to refill the Canon 681-2A001AA toner cartridge. 6 - 250 gr. 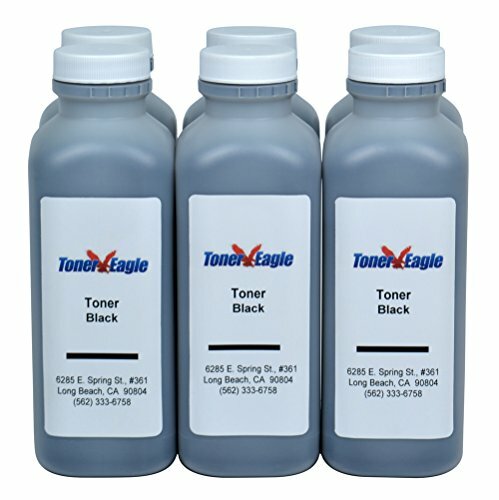 bottles of black toner (each bottle provides 5,000 pages at 5% page coverage). 2 - Screw-on funnel to pour the toner into the cartridges. 6 - Strips of foil tape to seal the filling hole. 12 - Plastic gloves to ensure that your hands stay clean while you refill your cartridges. 6 - Toner Wipes. These cloths are chemically treated to attract toner dust. 1 - Set of Instructions: We are a U.S. based company and are known for our easy to understand instructions written in American English with very clear color photographs guiding you through every step of the process.